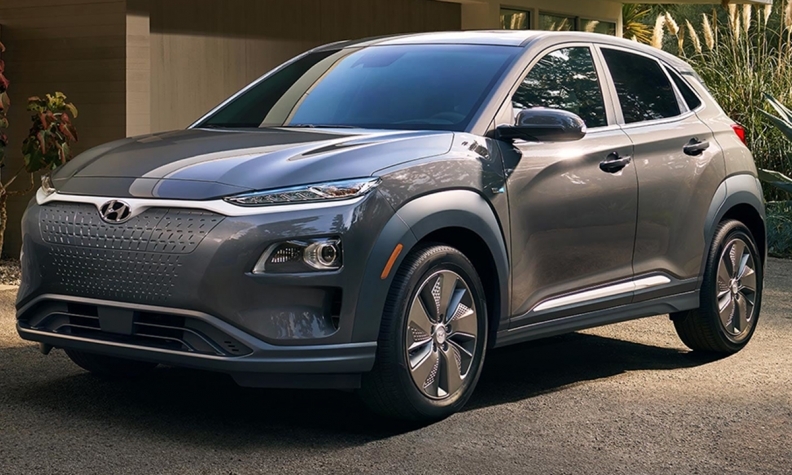 LOS ANGELES — The lively Kona Electric will begin trickling into dealerships soon with an estimated range of 258 miles on a charge, pushing it past the Chevrolet Bolt and lower trims of the Tesla Model 3 sedan and the much more expensive Model X crossover. But don't call it a "Tesla fighter." With the electrified Kona, Hyundai isn't trying to take on any particular brand. Rather, it's looking to upend the notion that families with electric vehicles need a gasoline-powered backup car. "We wanted to have something that's very affordable and performs well, does what people expect and replaces a gasoline vehicle in the household — not be an additional vehicle in the household," Mike O'Brien, Hyundai Motor America's vice president of product, corporate and digital planning, told Automotive News during a press event here. Automakers plan to roll out more than 60 electric and plug-in hybrid models in the U.S. through 2020. But for now, the Kona Electric, which begins arriving in stores this year in California before rolling out to other zero-emission focused states in the West and Northeast, will occupy its own niche in the market. The ample range is a key selling point, but its crossover layout will differentiate it from other battery EVs in its expected price range. The Bolt and Nissan Leaf are compact cars, and O'Brien says consumers would have to drop a lot more cash on the upcoming Jaguar I-Pace or Model X if they want an electric utility vehicle, or opt for a plug-in hybrid. The Kona Electric's platform sibling, the Kia Niro EV, is due in the U.S. next year. Hyundai is also introducing a hydrogen-powered electric crossover in the U.S. this year. Until now, though, consumers looking for affordable electric crossovers haven't been able to meet their needs, said Akshay Anand, executive analyst at Kelley Blue Book. Anand says the Kona Electric has potential to do well, pointing to a survey showing that an average range of around 300 miles appeals to consumers. But Hyundai will need to be aggressive in promoting the Kona EV to build awareness, he said. It can't be an afterthought behind its gasoline-powered sibling, which launched early this year. Anand said Hyundai should stress that the Kona's range and utility are enough for it to be a primary vehicle. Hyundai can take the messaging around the vehicle in a few directions, with its range, 201 hp, style and utility, but O'Brien wants to emphasize that charging won't be a chore. The Kona Electric comes standard with Level 3 fast-charging that can take its battery from 0 to 80 percent of capacity in 54 minutes at a 100-kilowatt charging capability. Aside from Tesla's Superchargers, which work on Tesla vehicles only, public fast-charging stations can be harder to find than conventional ones. But Electrify America, ChargePoint and other developers of charging stations are accelerating their installations of fast chargers. Hyundai expects owners of the Elantra, Sonata and Tucson to be among the converts to the Kona Electric. While education around EVs is still an issue for some, O'Brien is confident the vehicles will continue to gain acceptance as people see more of them on the streets and learn about the experiences of their friends and relatives. "We're seeing the market for EVs expanding well beyond the current Tesla customers," said O'Brien, who added that Tesla has helped bring more awareness to EVs. "We imagine a different consumer base. A lot of our buyers will come from our loyal owner base that we already have. "I'm not expecting that we're going to have a lot of Model 3 people getting their deposits back," he added. "That wasn't our goal." Pricing hasn't been announced, but O'Brien said it will be roughly half of the I-Pace's $70,495-$86,895 range. The market for EVs has not taken off, but there's a growth opportunity in the segment among minority buyers, says Marc Bland, IHS Markit's vice president of diversity and inclusion. Bland, while discussing ethnic trends in the industry, said brands would benefit from educational campaigns that lay out how electrified vehicles work. Toyota, for instance, began sponsoring Afropunk music festivals in Brooklyn and Atlanta several years ago to make inroads with African-American consumers for its hybrid lineup. At the festivals, Toyota displays hybrid options such as the Prius and RAV4 crossover alongside booths that explain how sustainability impacts health, business and communities. "I think the next frontier for ethnic consumers is how do we get a higher take rate among African-Americans and Hispanics for electric vehicles and hybrids," Bland said in an August interview. "I think it boils down to education and lack thereof. There's a lot of misunderstanding of what an EV is and can do."